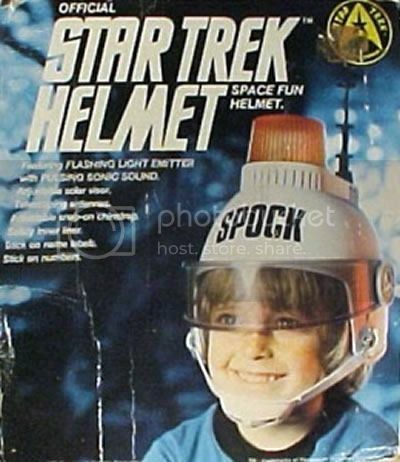 Contrary to what you might think, what appealed to me most about this ridiculous Star Trek helmet toy (featuring flashing light! and antenna thing!) wasn’t that it provided yet more compelling evidence of Star Trek‘s inherent uncoolness. No, I’m just reassured to know that in the future according to Star Trek, simple-yet-effective technology will have been developed to protect Special Needs particularly-hyper A.D.H.D. children from themselves. And to warn others of their threat. Via The Retroist, who doesn’t think that kid’s name is really Spock. Uhm– That’s Spock’s hair dryer, right?